My book this month? Hidden Figures by Margot Lee Sheerly. Unless you've been in hiding, you know that this book has been made into a very popular movie that is currently in theaters. I haven't seen it yet, but I really want to. I have a feeling that this movie is going to be one of the rare occasions where I enjoy the movie more than the original book. 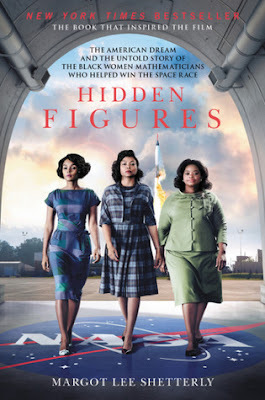 Both are about a mostly unknown (until recently) group of African-American female mathematicians who worked at NASA and were the human computers behind the space program. The story is interesting and needed to be told, however, I found the book to be a little dry. I wanted to hear more about the personal lives of these women, but it was more on the technical side. I also felt the author jumped around from character to character and I often confused the storylines. Even so, I'm glad I read the book because it exposed me to a side of history of which I was previously unaware, and that's always a good thing.